I hope that everyone had a wonderful Father's Day weekend. My Dad's job keeps him traveling across the country and I wasn't able to see him. I definitely missed him but being able to hang out with my Grandpa and other family members was really nice. I hope you all were able to spend time with, talk to, or take some time out to think about your Dad. I took a virtual stroll through my pins on Pinterest and found a great recipe on SkinnyTaste. This is a healthy version of a Taco Dip - which is one of my all time favorites at parties. I have never bought or cooked with olives before so I had no idea what I was buying. Is this a good brand or type of olive? I started with the cream cheese, sour cream, salsa and taco seasoning. I combined the ingredients with my electric hand mixer. The mixture was thinner than I had anticipated. The original recipe suggests a glass dish, but since we were traveling I thought a temporary pan would be best. I typically would never use disposable items - so this was a rare case. I did make sure the pan was made with recycled materials. Next I chopped the iceberg lettuce and added it atop the dip. Next up I added the tomatoes. As I was chopping the tomatoes GB kept asking me if I needed help again and again. He's a very helpful guy but what that really means is: I wasn't chopping the tomatoes to his standards. I have to give him credit though- if this was 6 months ago, he would have taken the knife out of my hand and just taken over. Let's all give him a pat on the back for letting go of control. I was only supposed to add 1 cup of cheese but I kept pouring it on. I have to be honest, I'm obsessed with cheese. I just can't stop. I think I need a cheeservention. Finally I drained the can of olives and topped off the dip. GB told me olives are, and I quote, "really gross," so I only added the olives to half of the dip. It made for a less cohesive look, but I think it pleased the crowd. Verdict? The dip was delicious! I was so happy as I saw person after person going back for seconds. The only thing I would do differently is cut the sour cream or drain some of the salsa to take out some of the liquid. If the base of the dip was just a little thicker it would have been perfect! 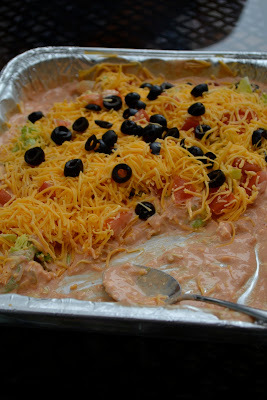 GB and I decided we would love to make the dip again for parties. It was easy, mostly healthy and scrumptious. What is better than that?